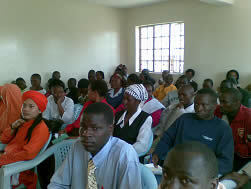 I took my new role as DSL (District Secretary) of Nairobi starting the second half of 2008. It was also a time of bereavement for us all in East Africa as in early July we lost two of our most active Dadas who were principals of our most popular primary and secondary schools in Nairobi. 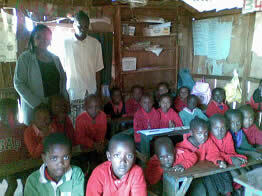 My new role landed me with five schools which are situated in the slum areas of Nairobi. Out of the five schools, two are well established. The one in Huruma has over 500 pupils and 15 teachers, while the one in Kangemi has almost 100 pupils and 6 teachers, both providing nursery to primary education. However, they lack the NHE values. The enrollment of two of the other schools dropped drastically after the January unrest, to less than 20 children per school. To revive enrolment, we started a hot meal programme in those schools. However, we may lose our Kwangare school which has about 60 pupils. had more than 50 teachers. I am excited to see how we can introduce our NHE philosophy and values to all five of these schools, it will be a challenge. Last weekend, Saturday 11th October, for the first since I’ve been in Kenya, we had a combined seminar on Ananda Marga philosophy for all the teachers in Nairobi and Nakuru. It was a very successful program and it inspired our teachers. I would like to organize future training for our teachers and welcome overseas NHE educators who would like to do the training. We need mostly early childhood and primary school teachers training. Please contact me if anyone is interested.